I've been seriously thinking about running the AR50 next year (2015) and how to go about preparing for it then an opportunity came up that I could not turn down. Pace an experienced running for the last part of the race! Pacing. So what does that word actually mean with regarding trail running? You've seen pacers on big half and full marathons holding signs that read '1:45' or '3:35' and a good pacer not only helps you reach your target finish but knows the course and how to warm up for those first couple of miles - or they should! In trail running especially 50 miles or longer a 'pacer' needs to do a bit more than just set a particular pace. A pacer in trail running is a 'trail companion' and not only helps the runner stay on course and not miss critical turns but helps the runner refill water bottles in Aide Stations (AS) and most importantly provides motivation to help the runner think of something other than his or her brain telling them to just pull over and have a nice lay down in the grass. Fuel : every 30 minutes. My prep for my 'trail marathon' since I was _only_ running the last 25 miles from Beals Point to the finish was to stick with what has worked for many the last few marathons plus toss in only a couple variations that I wanted to test out. In addition to the usual GU/Hammer gels I had a dosing flask of UCAN (2 scoops) and one of Roctane (2 scoops). For hydration since this was in early spring with very nice cool weather I could get away with a single 23 oz bottle but would not carry as hand-held as I normally would but in an Orange Mud quiver. The quiver also provided a large back pocket to put my emergency stash (the hope you don't need it kit) of anti-diarrhea, Tums antacid, Pepmo Bismo, Ginger Snaps, Ibuprofen, Moleskin, needle, etc. Next was the meet up at the half way mark of the race. When do you show up? An experienced runner who has already run the course can pretty much tell you roughly what their pace will be and roughly when to be at the meetup point but who knows what can happen in the first 25 miles? I decided to show up 1 hour before the meet up time and boy was that a good decision cuz my runner was on fire and was 20min ahead of schedule! Here's 'Dave' after 25 miles with a big grin on his face, poison oak blocker on his calves, girls stockings on his arms...what? Dave couldn't find his arm warmers for the rather chilly start in the early hours that day so converted girls long stockings to arm warmers. I had been waiting for ~45 min and wasn't sure if I had missed him or when he was going to 'come around the corner' then here he was with a fellow 'pace friend' in a Marathon Maniacs singlet. What a great feeling to connect with your runner and see him/her in great spirits! Next was helping to refill his double quiver as he swapped out socks, etc at the drop point then we were out in less than ~8min. Yeah you could say a little long but better to make sure feet, fuel and all is ready before tackling the next 25 miles. The next few miles to the next aid station were me trying to control the adrenaline that was coursing through me with a couple runners that had just run 25 miles of trail. 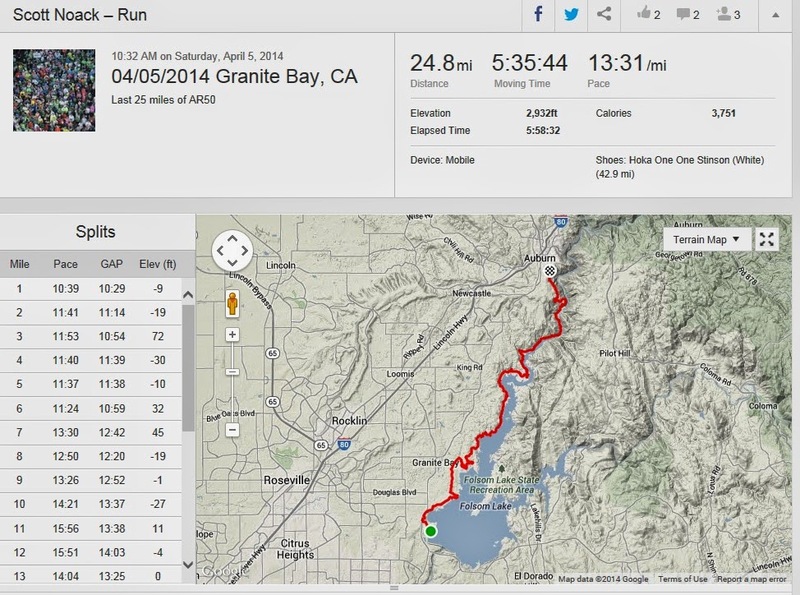 Dave was very clear that the goal pace was 12-14 min/mile and we were not to go under 12. [I learned much later what Dave was saving his legs for]. I worked at setting a nice ~12 min/mile pace while keeping an eye on the runners and making sure they hydrated and aid something at least every 30 min. Better to be a nag then get dehydrated or bong later. But, I really didn't need to worry about these experienced runners as I was newbie on the course. In fact, Dave and many others around me keep me entertained by explaining how this year course was slightly different that in previous years. We were just past Granite Bay and on our way to the new section called 'Twin Rocks Loop'. This is a new part that overlaps with the Mountain Bike route use by weekend warriors and at fate would have it a Triathlon that was running the same day. So, imagine if you will a whole bunch of ultra-marathoners dancing on very rutted single track and dogging the occasional Mountain Bike bombing down the hill. I'm surprised no one got hurt but many 'words' were exchanged with those cyclists. Dave happens to be an IronMan and has road that section of the trail many times so entertained us with stories from those days. I'm sure it was fun mountain biking but the rutted single track was a bit tricky and I often times would pop up to the top of the rut and run along one of the rims. Eventually we made it all the way towards the dam at Mormon Island or Mormon Point - I forgot the exact name. However, you could hear the rush of the water down below and the shear vertical cliffs and single track covered in canopy with slight breeze sure made this section a pleasure to run. Then, there was the 'Last Gasp' the last 3 miles of the race. 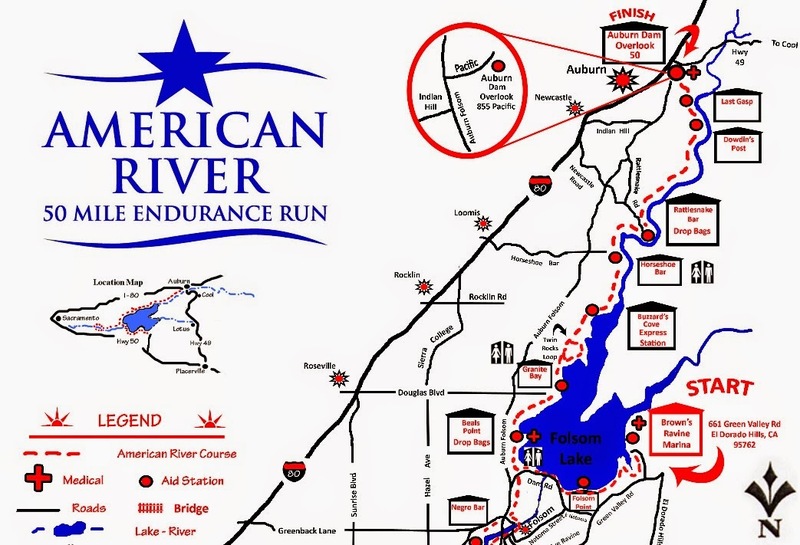 I'm not sure who designed this route but you pretty much follow along the river for miles and miles then at mile 47 for the runners you climb out of the valley and cover more than 1000 feet of elevation towards the finish line on top - in three miles. I knew Dave was holding a little back and didn't really understand until we got to the Last Gasp. He yelled out 'this is it here is were we get road kill'. He meant here is were I sprint link a deranged billy goat and take out a whole much of runners just dragging themselves up the hill. And so he did. Not only did he drop me his pacer (much to the amusement of the many spectators and AS volunteers along the side of the final accent) but he also dropped an estimated 16 runners in 3 miles! Dave run a great, smart race and not only hit his time but finished with a smile on his face. Officially, the last 25 miles took us 5:35 hours, covered 2,932 ft of elevation change at an average pace of 13:31 min/mile. You can see from the elevation change below that nearly all the elevation change occurs in the last 3 miles. Brutal at the end of a 50 mile run. I can't wait to run the race next year and put all the tips and tricks I've learned from my 'runner' to practice. They say AR50 is a 'beginners' 50 mile race because the race has one of the lowest elevation changes. You may be a great trail runner but you better respect the course or fall victum to it. The host of the race, NorcalUltras does a great job of organizing AS and the volunteers were great. Each aid station had plenty of ice, GU Roctane, GU Brew, boiled potatoes with salt, flat coke, etc.